This research may seem light-years removed from her current fascination with CGI-driven cinema in Spectacular Digital Effects. Yet, Whissel demonstrates that the Na’vi who inhabit the Pandoran biosphere in James Cameron’s Avatar (2009) or the CGI-generated Gollum who appears in Peter Jackson’s Lord of the Rings trilogy (2001–03) are indeed part of a longer history of visual effects—both spectacular and ordinary—in narrative cinema. 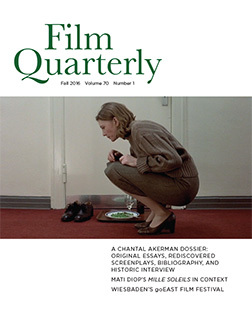 In order to strengthen these linkages between vastly different technological moments in the film industry, Whissel examines her chosen media objects as finished works but remains attuned to the circumstances of their production and reception. With her objects of study grounded in their historical contexts, what emerges is a deeper understanding of the genealogy of cinema in relation to modernity and postmodernity, new technologies, mass entertainment, and mass culture. 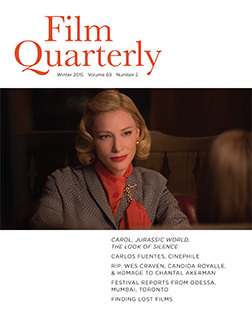 This approach also opens up many new questions and paths of inquiry for scholars and cinephiles. Because the genealogy Whissel maps is not fixed, her intervention is part of a welcome trend in cinema studies that refuses pat explanations of medium specificity. Whissel’s keenest intervention is her development of a new methodology for understanding spectacular visual effects. She achieves this by reading digital effects sequences through the rubric of the “digital effects emblem.” Whissel defines this concept as a spectacular visual effect that gives stunning and sometimes allegorical expression to a film’s key themes, concepts, and precepts. Rather than disrupt or halt the flow of narrative, as they are often said to do, Whissel shows that effects emblems rely heavily on dialogue and narrative to function in the films in which they appear. 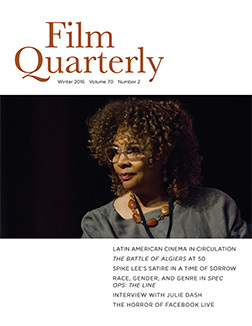 She returns to a significantly older, precinematic media form that was popular in sixteenth- and seventeenth-century continental Europe that required readers to synthesize an image with an epigram and accompanying text—the emblem book—not just to understand the current moment of the cinema’s digital turn, but also to demonstrate how popular films often mediate the experience of historical change, which inevitably includes the experience of technological change. 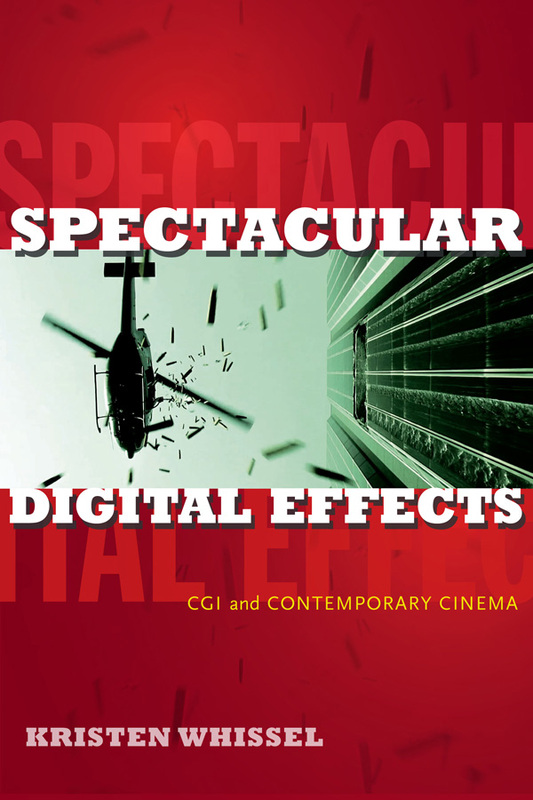 Spectacular Digital Effects: CGI and Contemporary Cinema is spectacular precisely because of Whissel’s deep understanding of early cinema, its technologies, and the networks of communication that undergirded its development. Her “leap” from studying cinema at the turn of the twentieth century to cinema at the turn of the twenty-first century is therefore not an interruption of earlier work, but a nuanced way of aligning her last-century observations on the modern project of nation building with her new concept of today’s “digital effects emblem.” In this postnational moment, when individual nation-states have lost their identity to supranational and global entities, contemporary cinema plays a vital role in representing a variety of very real global, cultural anxieties surrounding the ongoing development of digital technologies, digital and actual labor, and storytelling. 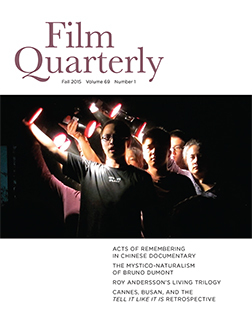 In keeping with this new Page Views column, FQ readers can now visit filmquarterly.org to read the first chapter of Whissel’s book in full; it appears online concurrent with the publication of this issue. This chapter, “The New Verticality,” sums up a century of cinematic experiments into screen space. Tracing narrative and technological shifts that propelled the desire for a wider screen experience from the 1920s through the 1970s, Whissel demonstrates that the screen could not go higher and deeper until digital technologies had developed the level of sophistication that has allowed the digital realm to become a vital space, one that keeps pace with the imaginations of writers, filmmakers, and audiences. 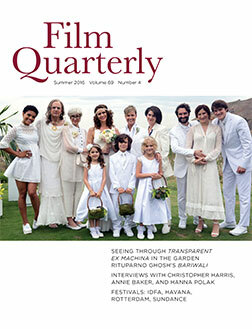 The new verticality continues to transform production and postproduction practices, and perhaps most importantly for general audiences and media industry players alike, it has altered understandings of the labor of filmmaking, acting, performance, and stardom. I recently had the chance to speak with Kristen Whissel about her research, her ideas, and how technological changes were already being felt behind the scenes, in the theaters, and beyond the screen. Regina Longo: Can you share a little bit more about Chapter 3, “Vital Figures: The Life and Death of Digital Creatures”? Here, you bring to bear your observations on the technological advancements in visual and special effects that have made fantastic CGI characters possible, simultaneously tapping into human desires for a more synthetic cinema and human anxieties around the ongoing rise of the (digital) machine. Kristen Whissel: Chapter 3 really came out of all the different digital creatures that have emerged in mainstream cinema in the past fifteen to twenty years—whether they were purely CGI-generated characters or whether they were a combination of live action and motion capture that was translating human performance into something else onscreen, regardless of which digital tools were used to create them. Villain or protagonist, these creatures are always lethal—they have an excess vitality—they are more than alive—and I wanted to answer the question of why this is the case. To do so, I went back to arguments about medium specificity and found that this was fundamentally an ontological question. The digital creature is always more alive as a form of compensation for ontological difference—the characters are overcoded. 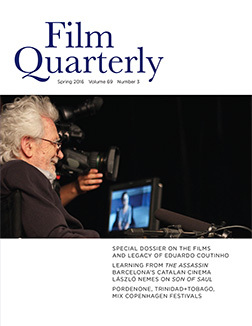 This is a textual strategy for addressing questions of performance in CGI cinema, by contrasting live action performances with digital performances, such as the dinosaurs in Jurassic Park (Steven Spielberg, 1993) or King Kong in Jackson’s 2005 version of King Kong, or Dren in Splice (Vincenzo Natali, 2009), that have no human corollary within the narrative. Such overcoding in many respects compensates for the ontological difference between digital creatures and live action characters. Through the roles they play and in their digital designs, digital creatures are charged with an excess vitality that compensates for the fact that they are often pure code and never existed in space and time with live action characters. Moreover, they often have the central function of mediating life and death in the fictional worlds in which they appear. Longo: What does it signal that digital creatures mediate life and death? Whissel: Digital creatures now bear the burden of life and death. I wanted to think through the ways that digital creatures respond to questions of life and death outside of their narratives. How do the stories onscreen respond to digital technologies that more increasingly mediate life or death in the everyday life of human beings? It seems to me that they participate in a broader culture that is negotiating very important questions about the technological mediation of life and death. Such mediation includes the mapping of the human genome or medical technologies that create, sustain, or protract life in ways that force us to redefine life and death. Of course, trying to determine the difference between human life and machine life—and even whether there is a difference—has been a long cultural and scientific obsession. I hesitate to make this leap directly, but it is interesting to consider that spectacular digital cinema creatures are emerging at exactly the same time as people are freaking out about the human genome project, about keeping humans alive when they have suffered brain death, about technologically assisted life. The anxieties and excitement surrounding scientific questioning and experimenting have opened up so many new ways to explore the relationship between new technologies, machine life, and organic life in cinema. Longo: And so, we are back to cultural anxieties at the dawn of another century. There are clearly corollaries between your earlier work on traffic and modernity in American silent cinema and your current work on digital effects emblems. But, I want to ask a different question: How have these anxieties and their cinematic representations changed? Whissel: The films I discuss in Picturing American Modernity are fascinated with both the perils and possibilities wrought by new forms of mobility, engendered by the expanding network of transportation and communication technologies that grew from and contributed to the US pursuit of an overseas empire, the rise of mass migration and immigration, and the emergence of new forms of labor, leisure, production, and consumption. In this respect, these films sensationalize (and make pleasurable) the experience of modern life in the US. The films I discuss in Spectacular Digital Effects were made for a global audience and accommodate heterogeneous interpretations and experiences by relying on the kinds of allegorical signification typical of the emblem. I show how the lethal vitality of computer-generated creatures emblematizes anxieties over the increasing technological mediation of life and death. Digital multitudes, in turn, function as allegorical images of sudden historical change while expressing anxiety over transformations in the relationship between the individual and the collective wrought by processes of globalization and new digital technologies. All of the films I discuss deploy their effects emblems to represent “the End.” I conclude the book with a discussion of Lars von Trier’s Melancholia (2011). This orientation towards apocalypse has as much to do with the armed conflicts and economic and political collapse that accompanied the new millennium as with changes in film production brought by CGI. Effects emblems therefore synthesize what the late Miriam Hansen called the cinema’s “mass production of the senses” with the emblem’s historical tendency to allegorize the profound uncertainty caused by historical change. 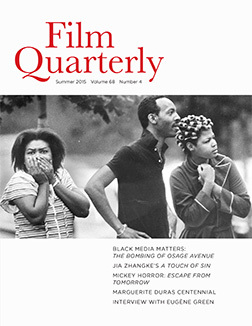 I wanted to add that the corollaries arise from the fact that Picturing American Modernity and Spectacular Digital Effects focus on the cinema’s articulation of radical historical changes taking place at opposite ends of the twentieth century. Of course, the years around 1900 and 2000 mark out periods of film historical change which have prompted debates about the relationship between spectacle and narrative. Spectacular Digital Effects deals precisely with the latter. Too often, visual effects are thought of as empty spectacles that contribute little or nothing to the development of narrative, story, or character. In contrast, I argue that spectacular CGI often functions as “effects emblems” that give stunning expression to the key themes, anxieties, and desires of both the films in which they appear and the historical moments in which they were made. Just as emblem books required audiences to synthesize an image with an epigram and accompanying text to glean its full significance, I argue that spectacular effects sequences must be analyzed in relation to dialogue and story: all work together to crystallize a film’s major conceits, which are often inseparable from the experience of recent historical change—including technological change. Longo: I predict you will write a third book that will not have to wait for the end of another century of technological change. In that case, because it’s clear that time and space are collapsing and changing with advances in digital technologies, where do you see things going next for digital cinema? Will human beings ever escape their own narrative conceits and allegories and surrender to a form of digital cinema that is not compelled by maintaining continuity with the stories and technologies that came before? Are you planning a trilogy? Whissel: I am reluctant to speculate about the future—mostly because accurate predictions are rare. That said, I think that the turn towards 3D—the topic of my third book—is fascinating, not only in big-budget films like Gravity (Alfonso Cuarón, 2013), but also in documentaries like Cave of Forgotten Dreams (Werner Herzog, 2010). Both make extreme and/or inaccessible places available to vision, while 3D makes the experience of those spaces uncanny. In Cave, this effect was underscored by viewing the oldest known figural representations through new digital technologies. In their presentation of such landscapes, digital 3D films pick up where stereography left off; here I am thinking of nineteenth-century stereographs of strangely beautiful, remote landscapes of the American West made for easterners who would never visit such places. I am also interested in recent uses of positive and negative parallax effects that link depth with (the pursuit of) knowledge and emergence with affect: think of Matt (George Clooney) disappearing into the void (the intended destination of the Hubble telescope) while rattling off directions key to Ryan’s (Sandra Bullock) survival versus Ryan’s tear floating into the theatre when she realizes she is going to die. This use of parallax is also at work in the classical 3D films Dial M for Murder (Alfred Hitchcock, 1954) and House of Wax (André De Toth, 1953). All of which is to say that I think that my fascination with new technologies derives from the way they allow us to see the past in a new light and vice versa. 1.Tom Gunning, “The Cinema of Attractions: Early Film, Its Spectator, and the Avant-Garde,” in Film and Theory: An Anthology, ed. Robert Stam and Toby Miller (Malden, MA, and Oxford: Blackwell, 2000), 229–35. This article originally appeared as “The Cinema of Attractions: Early Film, Its Spectator, and the Avant-Garde,” Wide Angle 8, nos. 3/4 (Fall 1986): 63–70. 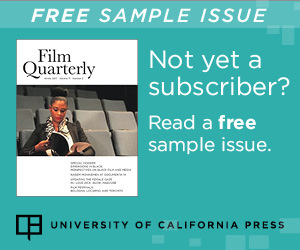 2.Kristen Whissel, “Uncle Tom, Goldilocks and the Rough Riders: Early Cinema’s Encounter with Empire,” Screen 40, no. 4 (1999): 384–404. 3.“Kristen Whissel on her book Picturing American Modernity: Traffic, Technology and Silent Cinema,” January 9, 2009, rorotoko.com/interview/20090109_kristen_whissel_picturing_american_modernity/.